NETWORK FINALS: We don’t have final network charts yet, but here were the adjustments from this morning’s prelims: ROSEANNE was even 0.1 bigger than its massive early number, and THE VOICE and THE MICK also gained 0.1, while SPLITTING UP TOGETHER and BULL lost the same. CABLE HIGHLIGHTS: USA’s WWE SMACKDOWN led Tuesday cable despite dropping 0.21 to 0.78, and UNSOLVED was down 0.07 to 0.38 (it’s worth noting that because of its big lead-in, its rating went from 0.49 in its opening 15 minutes to 0.30 by the last). HGTV’s FIXER UPPER fell 0.13 to 0.59, HOUSE HUNTERS dipped 0.04 to 0.40, and HOUSE HUNTERS INTL was steady at 0.36. TNT’s NBA doubleheader was at 0.56/0.38. MTV’s THE CHALLENGE rose 0.05 to 0.51, with a follow-up half-hour at 0.27. On Bravo, REAL HOUSEWIVES OF BEVERLY HILLS shed 0.09 to 0.51. Univision’s SELECCION MEX match was at 0.44. On History, FORGED IN FIRE fell 0.14 to 0.40, and CURSE OF CIVIL WAR GOLD was down 0.11 to 0.34. 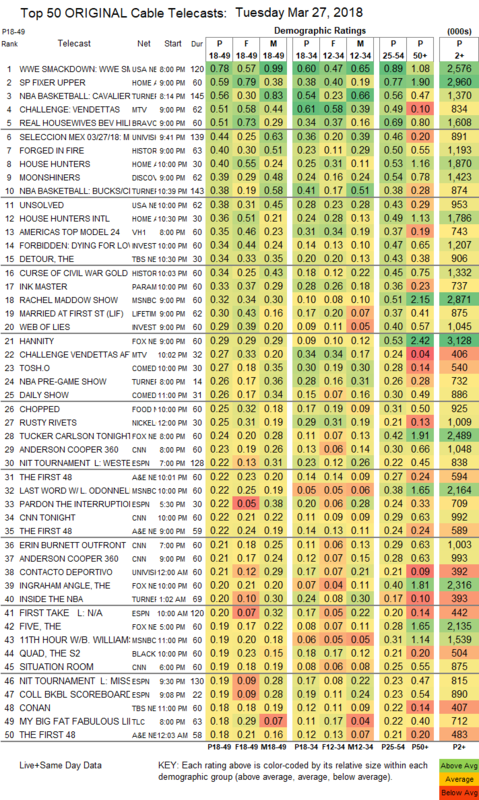 Discovery’s MOONSHINERS edged up 0.02 to 0.39. VH1’s AMERICA’S NEXT TOP MODEL held at 0.35. On ID, FORBIDDEN gained 0.03 to 0.34, and WEB OF LIES was down 0.02 to 0.29. TBS’s THE DETOUR dipped 0.04 to 0.34. Paramount’s INK MASTER ticked up to 0.33, and INK MASTERS: ANGELS returned at 0.14. MSNBC’s RACHEL MADDOW SHOW led cable news in the demo at 0.32/0.51/2.9M, above Fox News’s HANNITY at 0.29/0.53/3.1M, and CNN’s ANDERSON COOPER 360 at 0.23/0.30/1M. 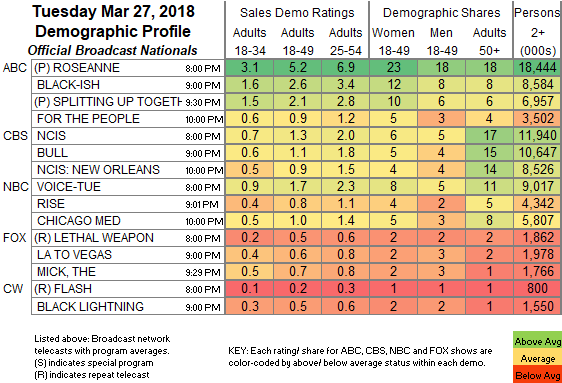 On Lifetime, MARRIED AT FIRST SIGHT fell 0.09 to 0.30, and LOVE AT FIRST FLIGHT was down 0.05 to 0.12. Food Network’s CHOPPED lost 0.04 to 0.25. On Comedy Central, TOSH.0 returned at 0.23, and THE JIM JEFFERIES SHOW had a 0.16 season premiere. A&E’s THE FIRST 48 was at 0.22/0.22/0.16. BET’s THE QUAD ticked down to 0.19. On TLC, MY BIG FAT FABULOUS LIFE dropped 0.11 to 0.18. Freeform’s SHADOWHUNTERS was down 0.03 to 0.16. The season finale of FX’s BASKETS fell 0.05 to 0.11. The conclusion of HBO’s ZEN DIARIES OF GARRY SHANDLING was at 0.11.